We are an AUTHORISED service centre for Optical Ltd.
We also service and repair many makes and models of photographic equipment. 35mm Cameras (SLR and Compact), Medium Format, Large Format, Digital cameras (DSLR, Bridge and Compact), Lenses, Monocular and Binoculars. We are specialists in the OLYMPUS OM SYSTEM and DIGITAL repairs. We supply spare parts for OLYMPUS photographic (film & digital) and audio products. * A fee is charged if the equipment is shipped/posted back to you. No Charge if collected from our shop! Our shop has a large selection of OLYMPUS accessories, both new and discontinued items! We stock hama and KOOD Photographic and Video accessories and Lowepro bags & cases. Student discount available on film, developing & printing supplies. Our in-shop partner; Truecolour Imaging Ltd. offers a 24 HOUR developing and printing service in our shop. 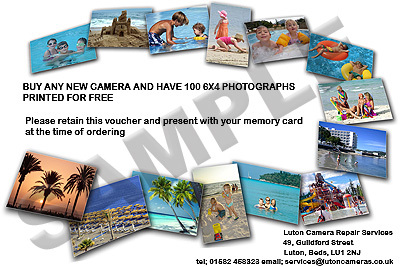 They can produce prints from film, digital memory cards or original prints. Truecolour can also produce Passport Photo's for most coutries; UK, Ireland, etc. £3.99. For more information call Truecolour: 01582 511 953 or visit our shop. Luton Camera Repair Services Ltd.